Most avid readers of self improvement and business books will have noticed a common thread among all of them: they are overly padded. Watch the TED talk or listen to a podcast cameo by the author, and you'll have absorbed 90% of the book content already. Naturally the anecdotes, statistics, and gritty details give more color and life to the author's premises that support learning styles of every type. But for folks with limited time and considerable ground they'd like to cover in the practical learning department, I think an index card summary would suffice. Of course I am not the first to make the observation that authors add some cushion to their content in their endeavor to build a brand, substantiate a product, and look good on a shelf next to other books. Harold Pollack first made this now widely accepted observation about personal finance books in a now famed article. Of course his followers asked "Where's the index card?" He replied with a photo of a handwritten index card summarizing all the key personal finance principles, which went viral. 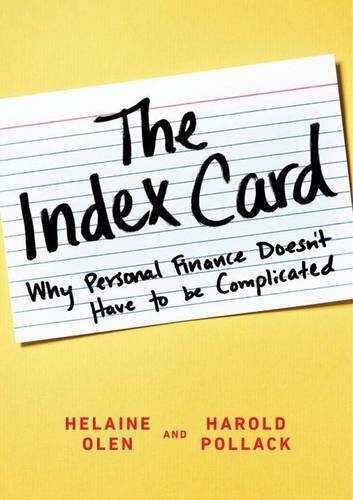 And, of course, his summary was soon padded out into a book: The Index Card: Why Personal Finance Doesn't Have to Be Complicated. In an effort to conveniently aggregate the latest wisdom and research for navigating our offices and lives, I am initiating a new series: the Index Card Book Summaries. As I continue to read these books that I think shouldn't be books, I'll share the pithy version of the key findings with you. Happy not reading!